Today my guest is John Holl, author of the new book Drink Beer, Think Beer (Amazon affiliate link). John is also senior editor at Craft Beer and Brewing magazine and author of The American Craft Beer Cookbook (Amazon affiliate links) as well as a beer judge. We discuss his work as editor at Craft Beer and Magazine as well as introduce his new book “Think Beer, Drink Beer”. John explains a bit of the history of the modern beer renaissance (craft beer revolution) and also how critical home brewing was to it. We talk about the role of big breweries and how the line between craft beer and big beer is increasingly blurred by the complex ownership relationships now. We discuss beer flavors and how flavor has a significant role in craft beer. I bring up the dominance of IPAs and we discuss whether it will continue to force other styles off the shelf. 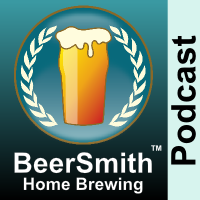 We discuss judging and tasting beer. John talks about some of the down sides of the craft beer revolution (shadows in beer). He explains how the way we enjoy beer in tasting rooms has evolved and contrasts that with beer at home. We talk about the “death of subtlety” in beer. John discusses the leveling off of growth in craft beer and how it may be part of the normal business cycle. Thanks to John Holl for appearing on the show and also to you for listening!